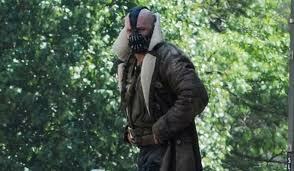 Some recent footage has surfaced displaying Bane delivering a speech to “Gotham Rogues” at a football stadium. The rogues bit raises some questions; is Bane trying to lead a revolution? I have to say Bane does sound a lot more different to what was expected. Being the way he is you would of thought of him to be a bit gruff, but he has an odd accent to his voice and at times he sounds like he is having difficulty. Very interesting indeed, but what is worrying is that there has been so many reveals from this film, and in some respects it hasn’t been generating the most enthusiastic expectations (as seen recently with Catwoman’s first image) so hopefully when something more official is released, it may shed a clearer light on what’s to come. Comments for Bane Speaks!! are now closed. Movie Vine / Comics / Bane Speaks! !